Ed and I have joked for years that we’re a bad/weird weather magnet. Back in the 70’s when we tent camped a lot it always seemed to rain or snow on us and last year we often seemed to drag rain and snow along with us, but of course southern California loved us. This year it seems abnormally cold temperatures are the camping surprise we’re dealing with. In fact the temps were so cold and windy heading out of Texas into New Mexico and Arizona that we fled to the border with California in a 3 day hard driving marathon. Landing on Christmas Eve at Cattail Cove State Park just outside Lake Havasu City, AZ we settled in for a few days of wind and cold nights. 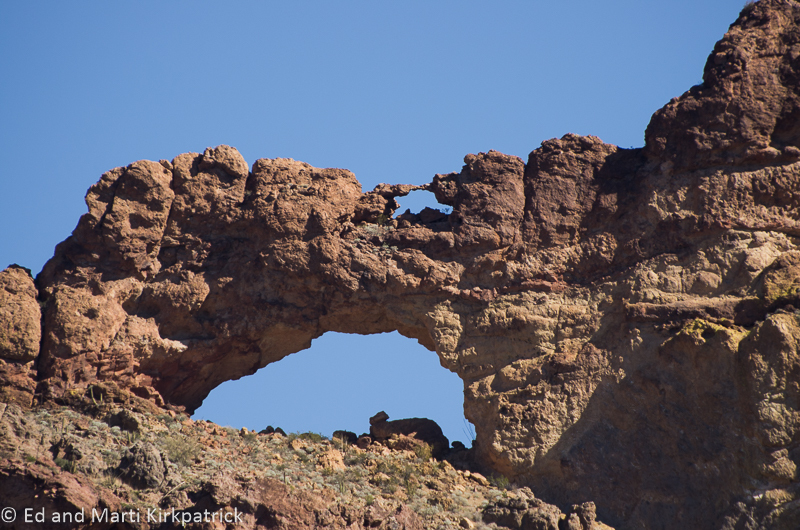 While like all the Arizona State Parks we’ve stayed at, Cattail Cove is very nice and we did see a Big Horn Sheep, neither of us sees much point in making this area a destination. Lake Havasu City was developer Robert McCulloch’s dream based on the recreational draw of the dammed Colorado River and The London Bridge which he purchased, disassembled, shipped and reassembled here as a tourist attraction in 1971. I remember we laughed about this when it happened, and now that we’ve seen it we’re still shaking our heads. See us having fun on our hike? Windy Point Overlook on the Mt. Lemmon summit drive. Braving the cold we decided to visit some or our favorite MVL places from last winter. We popped down to Bisbee (where it poured cold rain) planning on dinner and drinks at the wonderful Santiago’s only to find them closed due to a water main break outside their door. We did however have a delightful afternoon (beer was involved) at the Old Bisbee Brewing Company and of course breakfast at the Bisbee Breakfast Club. 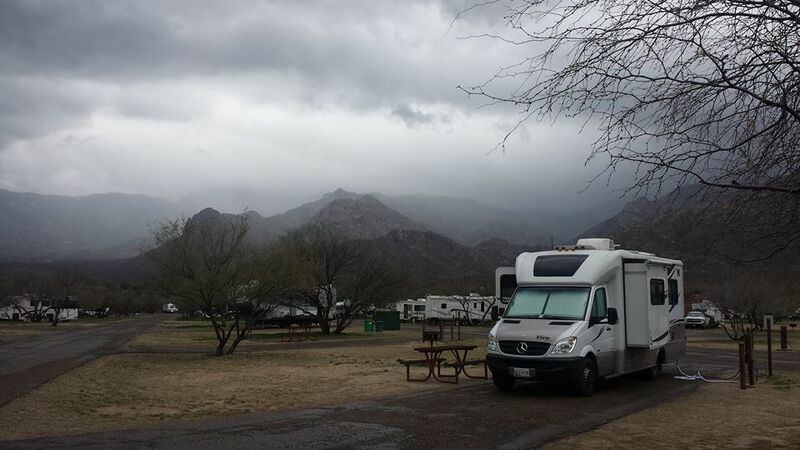 From our Picacho Peak State Park campsite looking across the valley, a clearing storm over the Picacho Mountains gave us a wonderful gift. 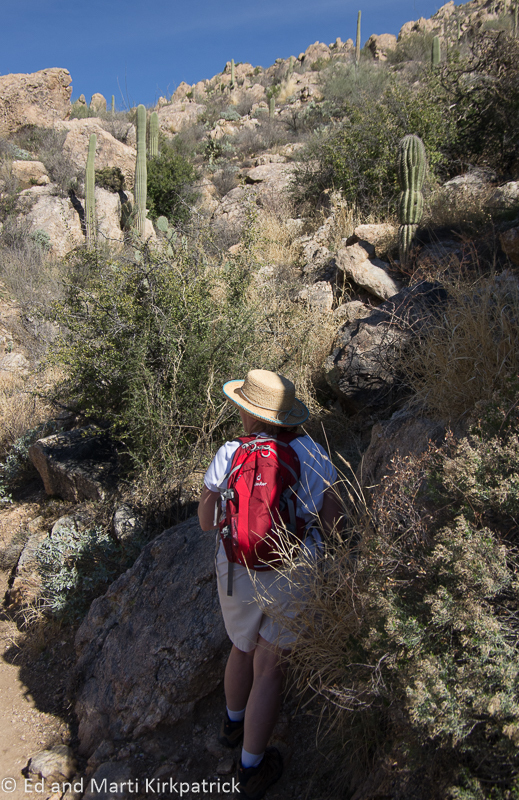 We revisited another one of Arizona’s wonderful state parks Picacho Peak State Park where I went on a steep, rocky, wonderful hike up the mountain without Ed who was suffering from a weak knee problem. From there down to quiet little Ajo and the Shadow Ridge RV Resort (resort, no, but nice and a good laundry) where part of the fun is hearing and seeing the “boys out to play” in their A10 Warthogs and other really cool jets over the Barry Goldwater Air Force Range. 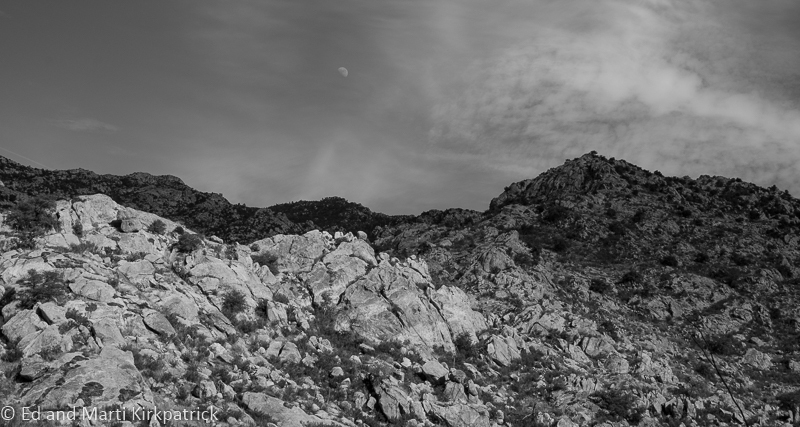 Pusch Ridge Wilderness Area from Catalina State Park. Bird’s nest in a saguaro cactus arm. 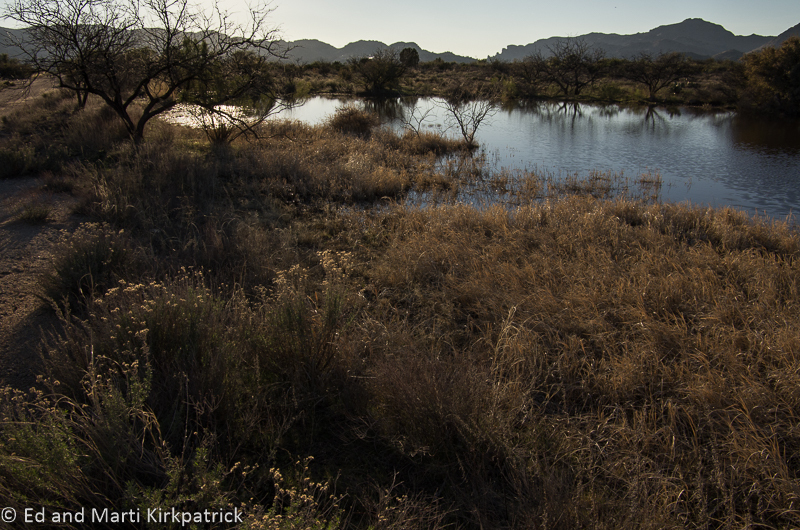 Sutherland Wash in Catalina State Park. Hoodoos on the Mt. Lemmon summit drive. Picacho Mountains on Marti’s hike up the Peak trail. We always have gorgeous sunsets at Picacho Peak State Park. Tillotson Peak in Organ Pipe Cactus National Monument south of Ajo, Arizona. 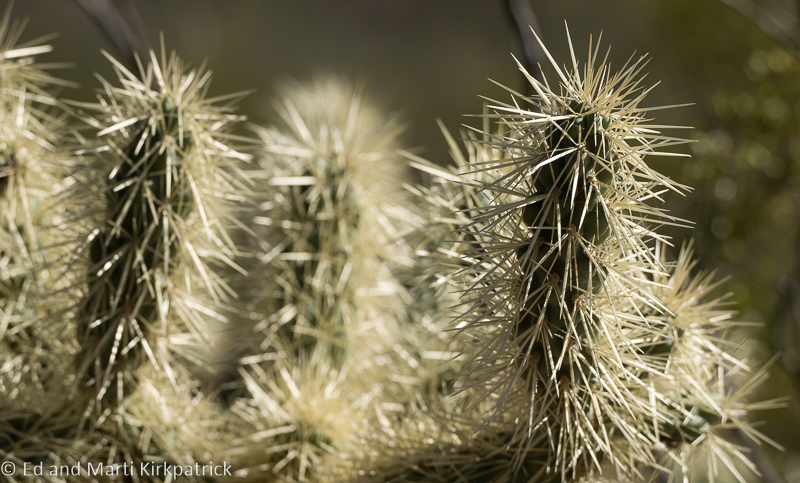 Lots of very sticky sharp things on a Saguaro Cactus. Palo Verde trees have green bark which does the photosynthesis usually done by leaves. 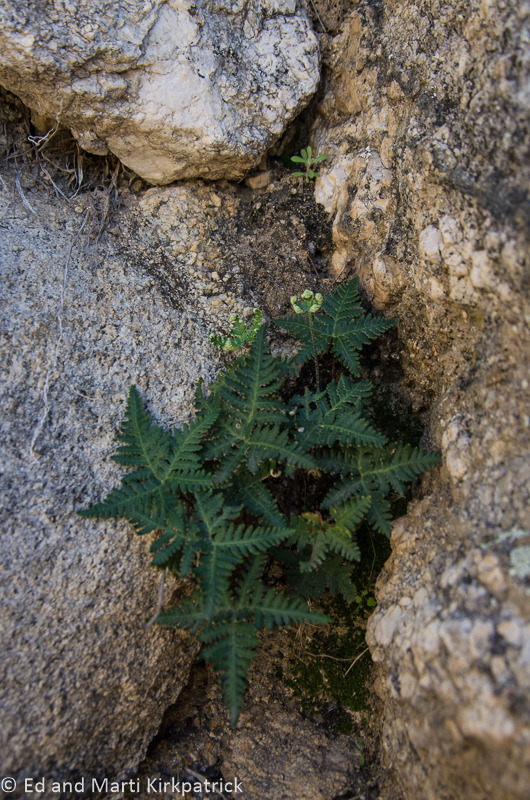 They also have leaves which drop in winter. 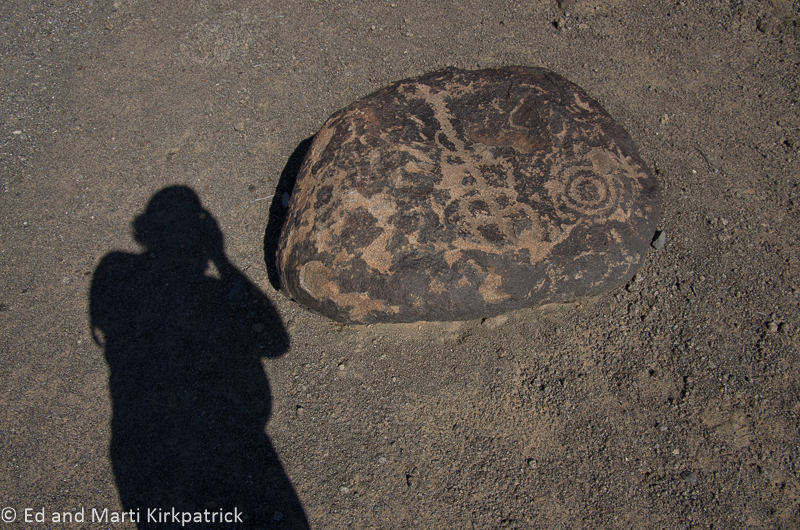 Does this rock make me look fat? 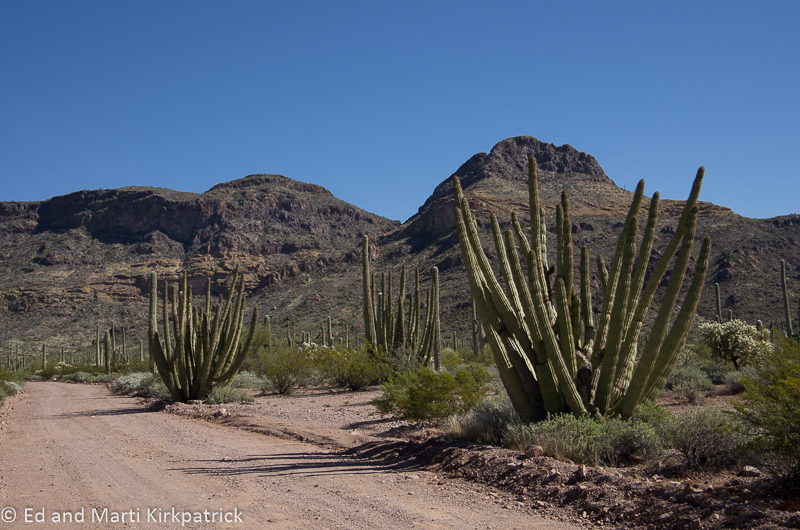 One last photo of the Picacho Mountains with I-10. 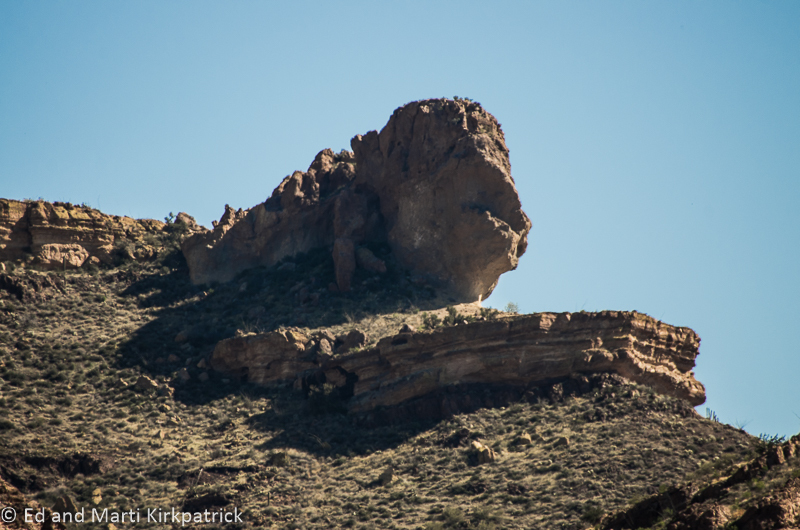 The beauty and wildness and ever changing landscape in the bit of Arizona we’ve been traveling is wonderful. 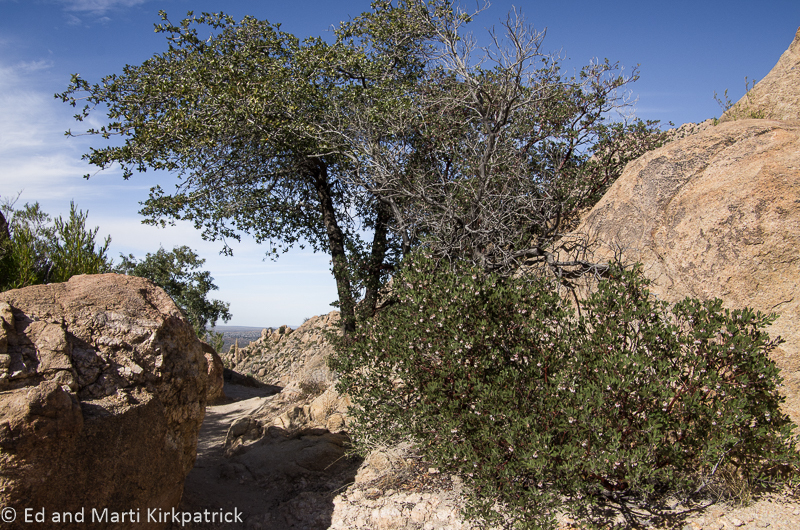 With elevation changes and just curves in the road, the geology and flora changes, often radically. The minerals in the rock means that color variations can be both subtle and stark, but also beautiful. Those minerals also mean there are mines all over the state and most are huge and very destructive. We know we need the materials, but we also believe our stewardship of this land means we must not take and not repair regardless of inconvenience or cost. So hang onto your hat as we cover a lot of ground and add places to your MVL (MUST VISIT LIST 🙂 )!! Local Mercantile, gas station, restaurant and Mexican Insurance dealer. 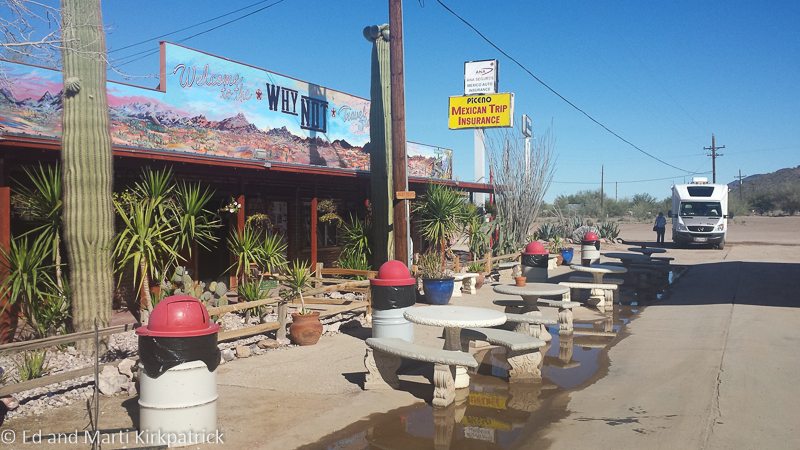 We did our first boondocking outside of Why, AZ, a tiny blink of a town at the “Y” intersections of State Hwy 85 and 86. The USPS being what they are would not let the local folks have the name Y for their town because a town has to have at least 3 letters…go figure …hence…Why. Boondocking mostly on BLM land (Bureau of Land Management), National Forests, State Land Trust lands means 98% of the time, no fees, no hook-ups (water, electric, sewer) and no “real” camping sites. Just pick an obviously used spot (worn, probably with a stone fire ring) and claim it as your own, but not too close to your neighbors if there happens to be some, and at Why there were. We found a nice spot with a tree and heard our first coyotes….all good. By the way, we have been told that the only Kyy-Oh-Tee is the one named Wiley. A hard habit to break, the proper pronunciation is Kyy-Oat. 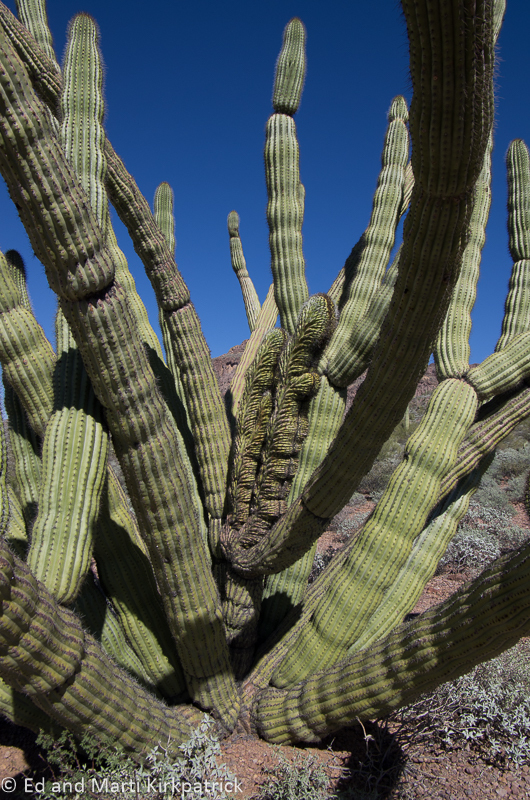 We visited Organ Pipe Cactus National Monument which shares a long border with Mexico. 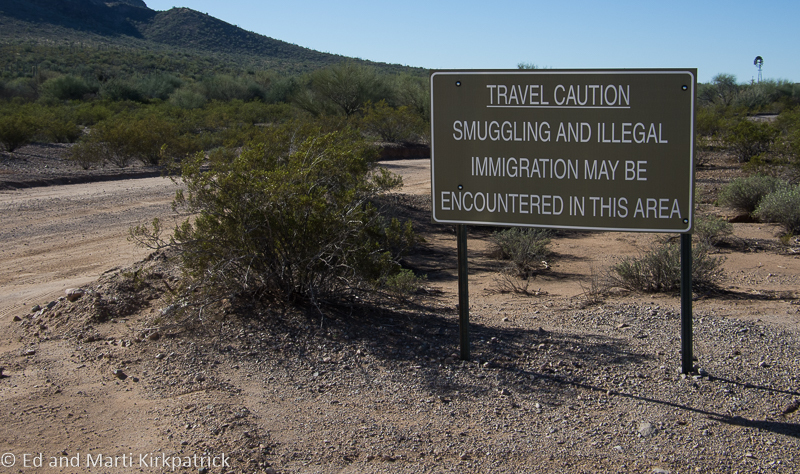 The Border Patrol are ALL OVER southern Arizona and we often go through their road check points. 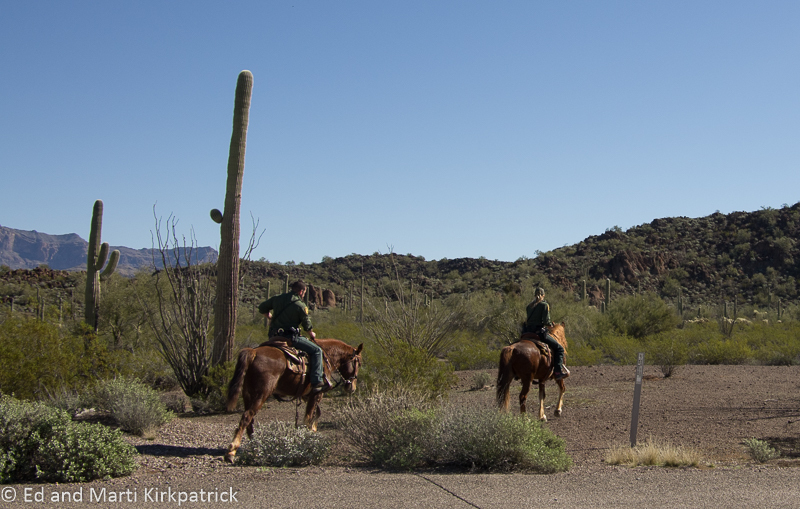 Here in Organ Pipe we chatted with two officers heading out on horseback to do their thing. These horses are wild mustangs who are naturally strong and “smart” about the desert. After being caught they are broken & trained by prison inmates and then given to the USBP. At the Visitors Center, we had to talk our way into being allowed to take our RV (technically 3 feet too long) onto one of the two loop roads through the park. It’s beautiful and we had a great time. Put on your MUST VISIT LIST. (but only in a car). 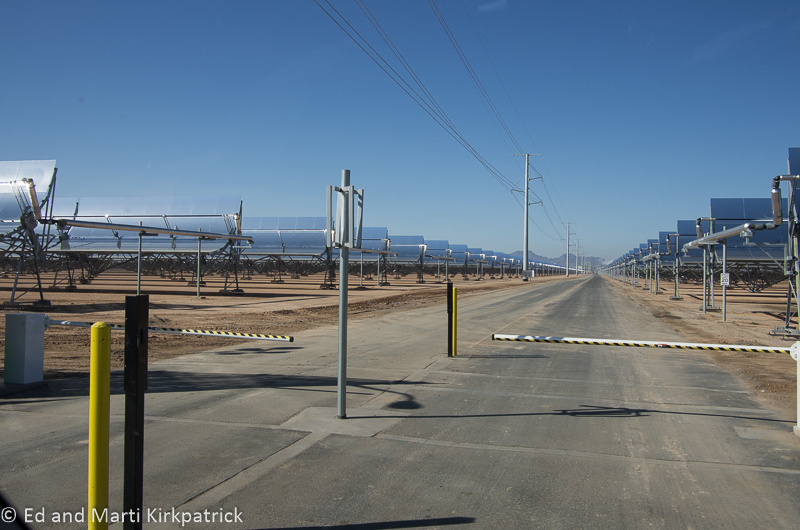 On our way to Painted Rocks we passed through Gila Bend… don’t bother with the town but west of there is the Solana Generating Station and miles and miles of irrigated alfalfa fields that are next to a huge factory dairy cow operation. Then we reversed directions and went east over RT 238 to Maricopa and eventually to AZ 60 and the Tonto National Forest for the night. Put this National Forest on your MVL!! Just beautiful!! 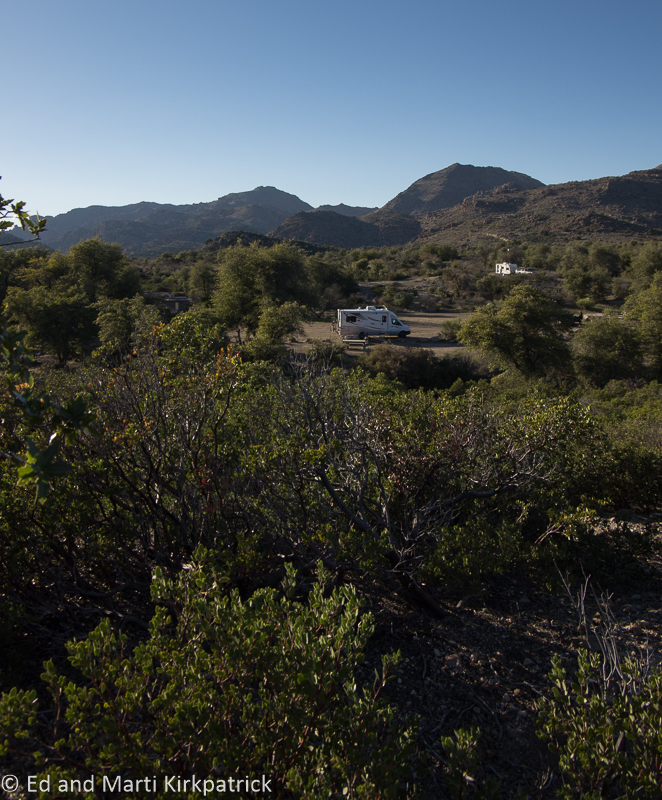 We boondocked at Oak Flat Campground. 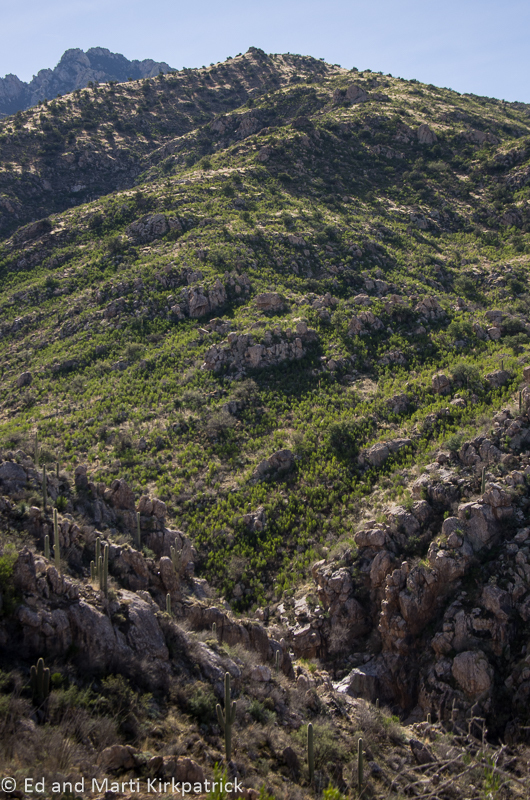 This land is sacred to the Apache and is under direct attack by the mining interests and sneaky political tactics. In fact the evening we were there while out for our walk we passed a young Indian doing some quiet ceremony next to a huge “bowl” in the local landscape. The place just felt special. We went to Globe for lunch and happened into the Drift Inn, a local saloon that’s been in business since 1902 and is quite colorful. Also in Globe we went to the Besh Ba Gowah Ruins. 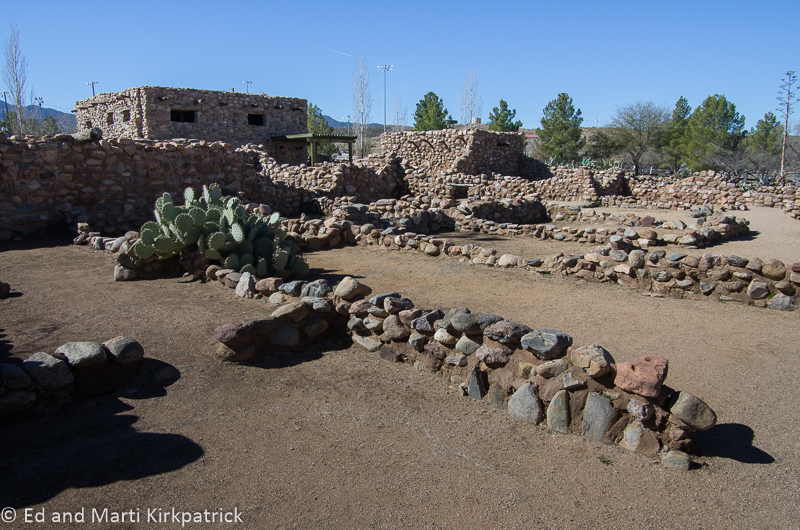 This small ancient pueblo and the little museum are excellent and should be on your MVL. Being children in the 1950’s/’60’s we know all about “duck and cover” and the next day to our surprise we saw a sign for the Titan Missile Museum. Of course we had to visit. 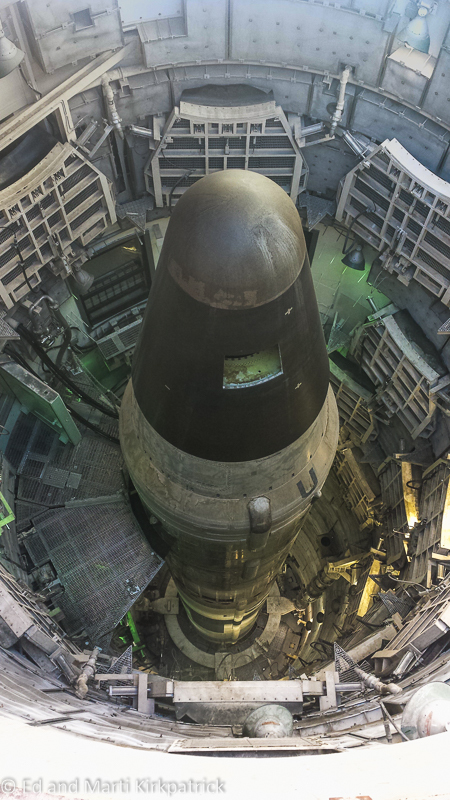 It holds the very last of 54 Titan II Ballistic Missiles in its silo! Yes, not only disarmed but with a hole cut in the cone so the world’s satellites can see that it is! The installation is exactly as it was when it was operational (minus the bomb and rocket fuel) and part of the tour includes a simulated (to an extent) launching of the missile. 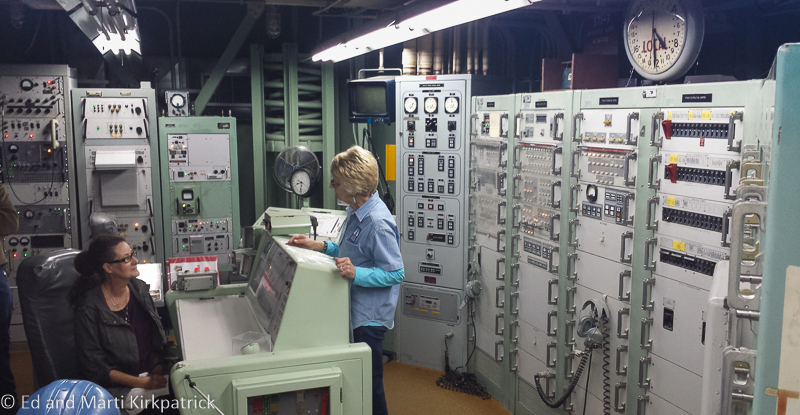 The tour guide randomly picks someone to be Commander, one of the two people who had to turn the launch keys. As it turns out the woman who “helped” launch the missile emigrated from the Soviet Union 30 years ago! She admitted to us later she was a little freaked out by the whole launch experience. Put this tour on your MVL, very interesting. 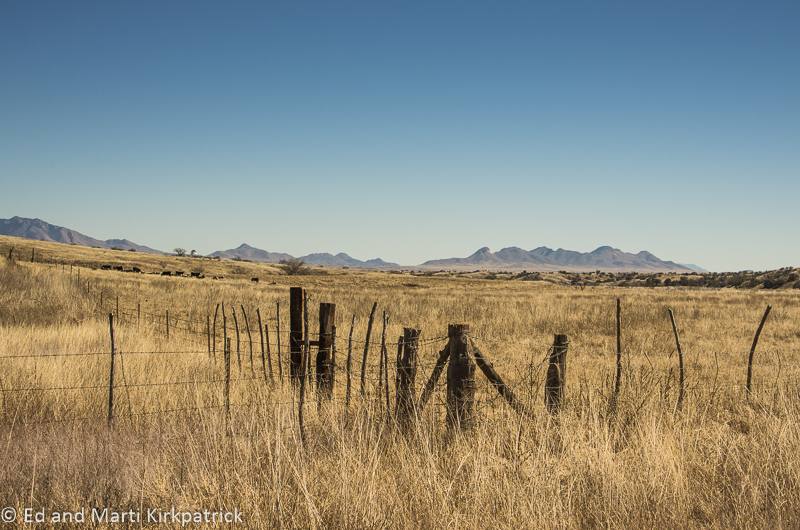 We drove across the Box Canyon Rd Hwy 62 to Sonoita. While in hindsight we know we were foolhardy to have taken this 23 mile narrow, windy, twisty dirt road, the drive was magnificent and we survived! 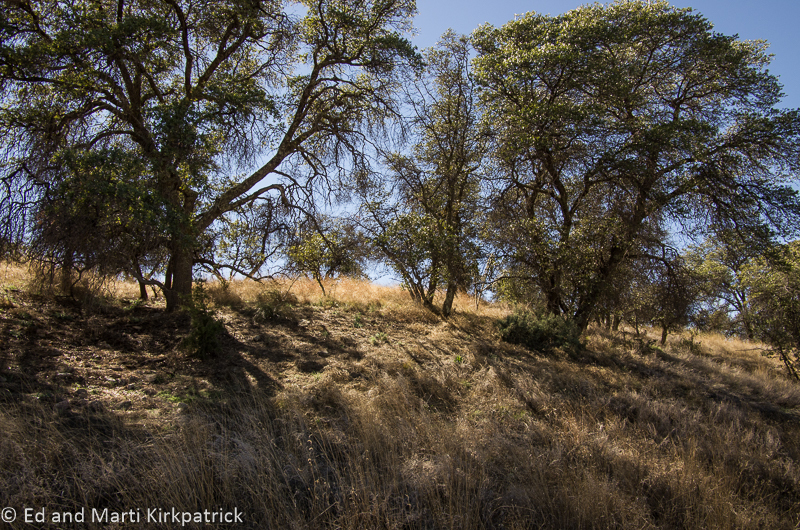 At the top of the canyon at 4000 ft. elevation, the surprise is that there are extensive grass lands and cattle ranches across large rolling hills. It is very pretty and a welcomed change from cactus and barren dust and rock. 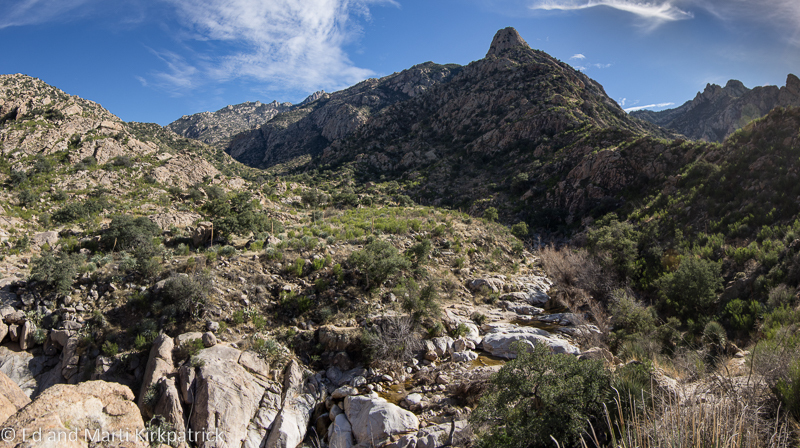 We are back at Catalina State Park where after the rains of two weeks ago the hills are actually showing some green. We are here for a few days of R&R and housekeeping chores. 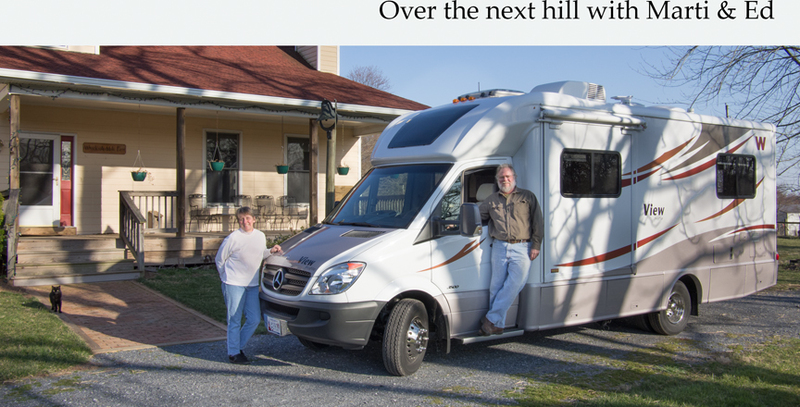 We even went to an RV show! We’re loving Arizona and hope you’re enjoying Ed’s photographs. 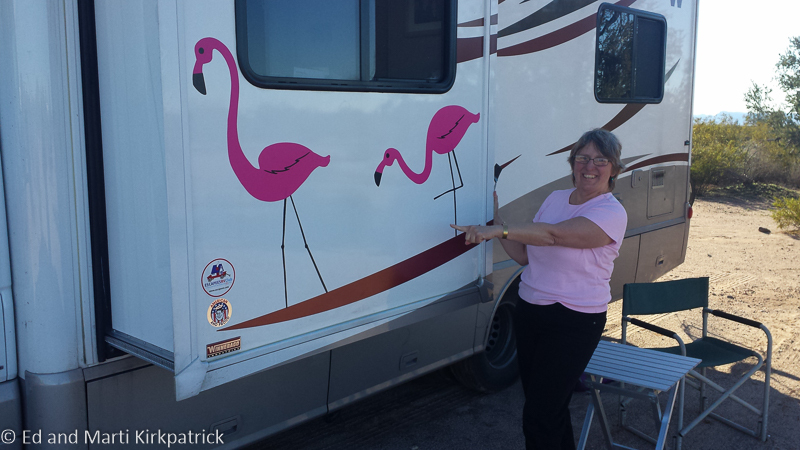 To replace our much missed plastic yard flamingo, our kids made and gave us these stick-on variety to decorate the RV. We love them. Kids and flamingos both. 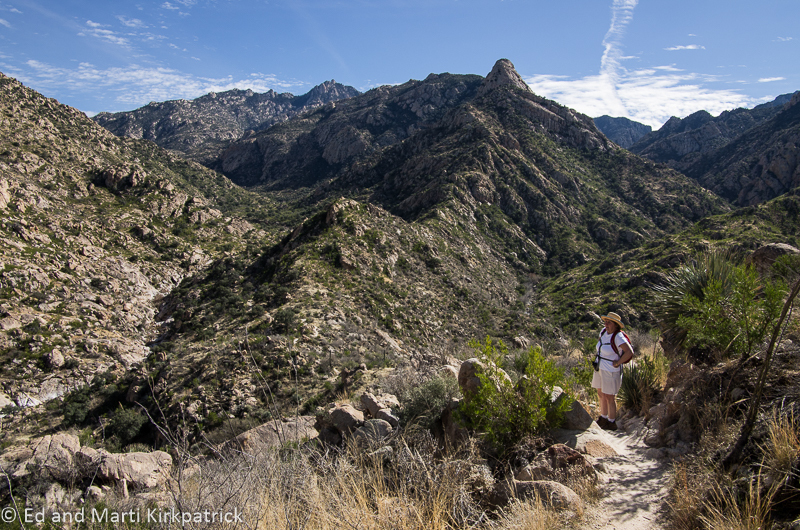 Catalina State Park and The Hike. Today in the desert wet, wet, wet. 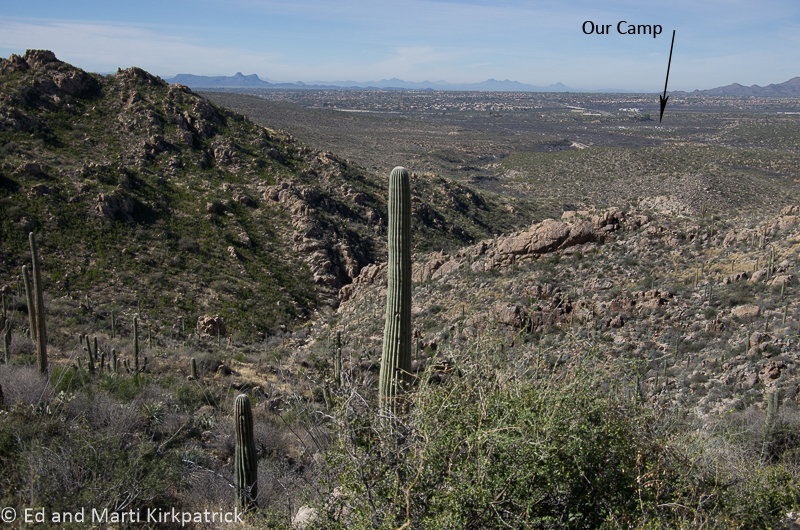 Today, Friday we are just north of Tucson at the Catalina State Park in the Coronado National Forest, which also includes the Pusch Ridge Wilderness Area. We have been here since Monday and keep extending our stay. Weather has been really great for a few days (not to rub it in) but today we are having heavy showers. It rained really hard all night last night too, but we did hear coyotes for the first time. That was really cool! We were excited to realize that Biosphere 2 which we had heard about when the whole experiment started and “failed” back in the early 1990’s, was just down the road 18 miles. The concept and execution was incredible and its evolution over the years has been remarkable. Our tour guide was very enthusiastic and we thoroughly enjoyed ourselves. So much so that when we left we were the last car in the lot and the gates were closed! Thank goodness they open out automatically! Put this on your must visit list. 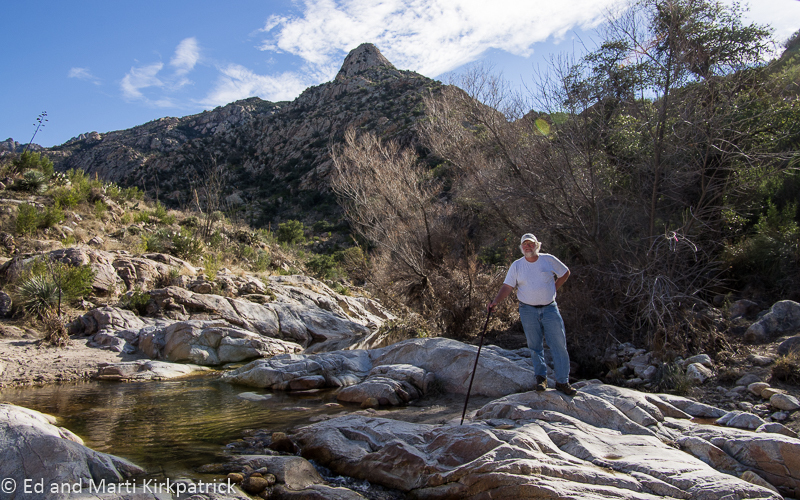 Wednesday, Marti marched us up the Romero Canyon Trail here at the park nearly 3.6 miles (that’s 7.1 miles round trip by our Garmin) with an elevation climb of over 1000 ft. to a place called Romero Pools, elevation 3700ft. These are nice deep pools of cold, cold mountain water draining down from the peaks and we just had to soak our hot, tired feet. There was flotsam in the trees about eight feet up so clearly an incredible amount of water can come crashing down this canyon. 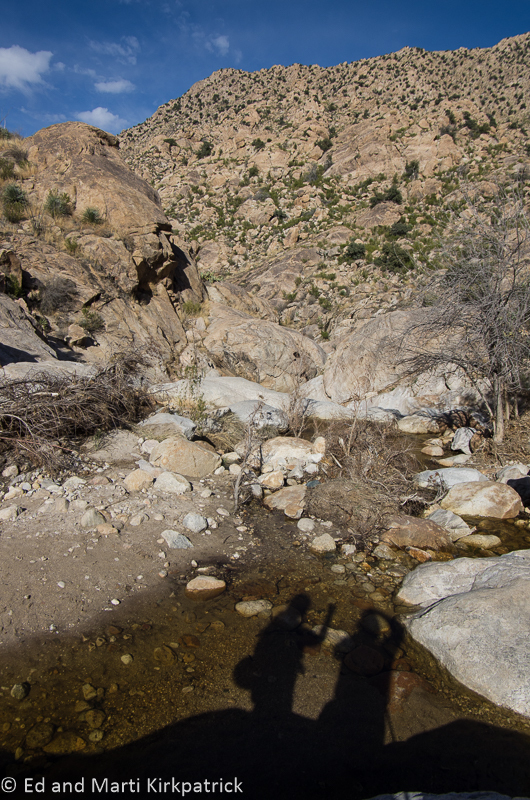 It’s amazing there can be so much water in this dry environment. A local gentleman told us they’ve had so much rain this year they are expecting a wonderful cactus bloom starting next month, we’ll have to come back. We left the trail head about 10AM and got back around 5PM nearly totally exhausted. This was a hard, hard hike but the landscape and views … just stunning. We also saw a deer, two Golden Eagles soaring, a lizard, two boatmen and assorted little songbirds, (no partridges in a pear tree). We did not see any mountain lions, coyotes or big horn sheep. Cool side (as in temperature) of the mountains. 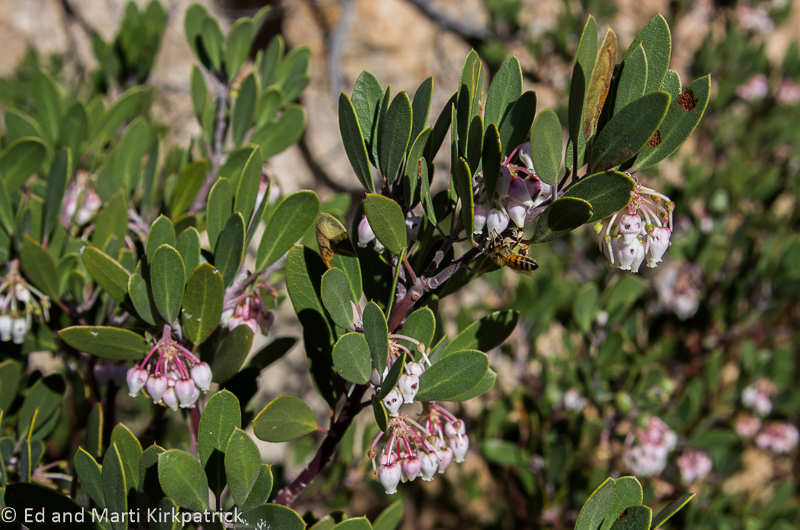 We’ve seen a very pretty plant called Manzanita (Little Apple) which is everywhere, but so far only in bloom at the higher altitudes and covered with honeybees! The fragrant blossoms smell just like honey. In fact, we have seen loads of honeybees here in the desert where there is no one to poison them. Manzanita to the right of the trail. Marti and Ed wave Hi! Another day’s outing was the Arizona/Sonora Desert Museum. While slightly interesting the explanation signage gave little actual information. Plus it was very crowded; at least it seemed so after our day in the hills. In general for our $36 we were not impressed, maybe being spoiled by free access to all the Smithsonian museums back home. 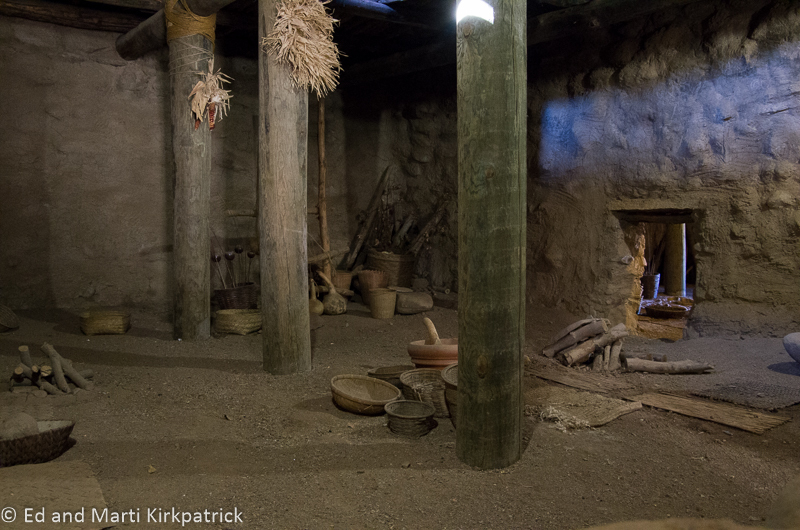 We do however highly recommend Chiricahua Desert Museum on NM Highway 80. We stopped here a week or so back and it’s well worth the $5 each. Put it on your must visit list. 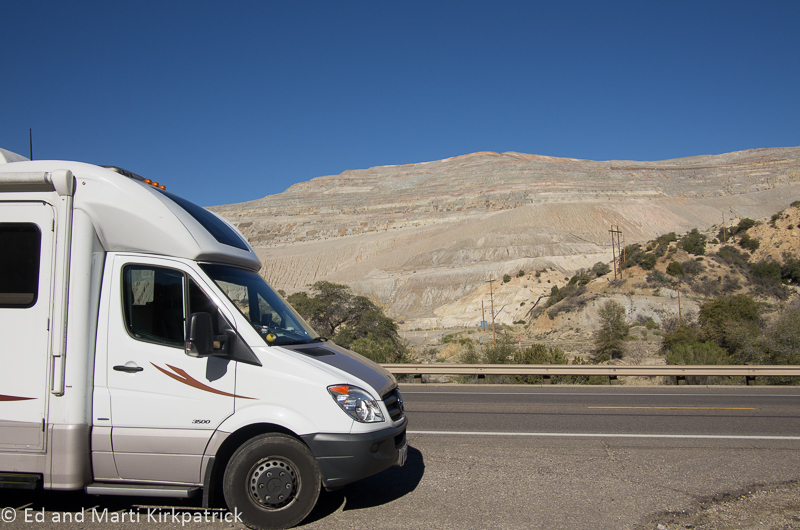 We are planning to leave here Monday heading out to a BLM (Bureau of Land Management) area near Why, Arizona, to boondock. Boondocking merits its own post but the short of it is camping on public land with no electric, water or sewer hookups, or anything else for that matter.